International Trans Day of Visibility calls for action around the world to celebrate transgender and gender non-conforming (GNC) people, and the bravery and power of living openly and authentically. 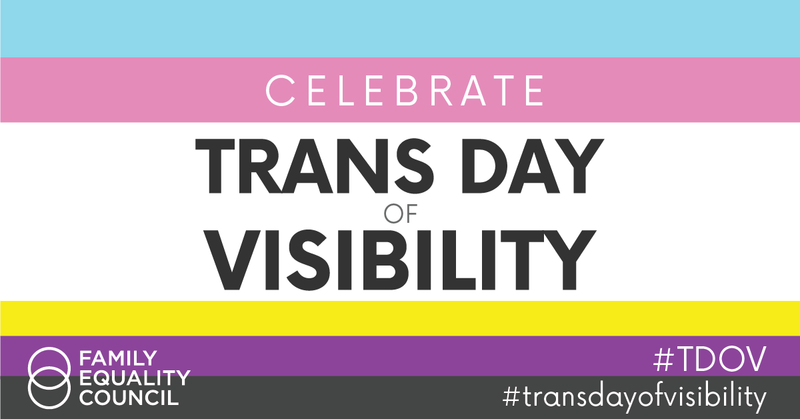 At the same time, this day serves to raise awareness about the work that still must be done to combat the discrimination trans people still face. This year, we celebrate the growing representation of transgender and GNC people in all aspects of life and media representation. And yet, when it comes to visibility of trans and GNC parents and prospective parents, there is still much work to be done. Across the country, our Family Equality program team offers in-person events to learn about family building. Check out our Educational Events page to learn more. Our next program, Trans Family Formation from Preconception to Parenthood, is coming up on April 6th in Oakland California. The event is free: register now. The Open Door Professional Training Program is designed to ensure family-building providers are prepared to care for the LGBTQ community with sensitivity and excellence. It was created for created for family-building clinicians including fertility clinic and surrogacy center staff, family law practitioners, pharmacists, pediatricians, holistic health providers (acupuncturists, chiropractors, naturopaths), social workers, midwives, and doulas. The modules can be utilized by individual practitioners or entire teams.